Investigators believe the second shooting victim at Virginia Tech was the man who shot and killed a campus police officer who was a father of five -- a crime that called to mind the deadliest shooting in U.S. history at the campus almost five years ago. The campus-wide alert for a gunman at large was lifted about 4:30 p.m. Students no longer need to shelter in place and can resume their normal activities as there is no longer a threat on campus. About 12:15 p.m., Officer Deriek Crouse, a 4-year veteran of the campus police force, made a routine traffic stop in the Cassell Coliseum parking lot. A man with no apparent connection to the stopped car walked up and shot and killed Crouse, according to Virginia Tech. The gunman -- a white male wearing gray sweatpants, a maroon hooded sweatshirt and a gray hat with neon green brim and carrying a backpack -- fled toward a parking lot near Duck Pond Drive known as the Cage, witnesses told police. About 1 p.m., a police officer saw a suspicious person in the Cage. A short time later, that person was found shot and killed. It's unclear if the man's gunshot wound was self-inflicted or if there had been an exchange of gunfire between the gunman and Crouse, but the officer who observed the suspicious man in the Cage did not shoot him, police said. A weapon of unspecified caliber was recovered near the second body. At Virginia Tech, where the deadliest shooting in modern U.S. history took place almost five years ago, students react to the slaying of a campus police officer. “The investigators feel confident that we’ve located the person, but I can’t give you specifics and I don’t want to confirm that,” Virginia State Police Sgt. Bob Carpentieri said. Police are waiting for DNA and ballistics results to confirm they have the shooter. Several law enforcement agencies responded. 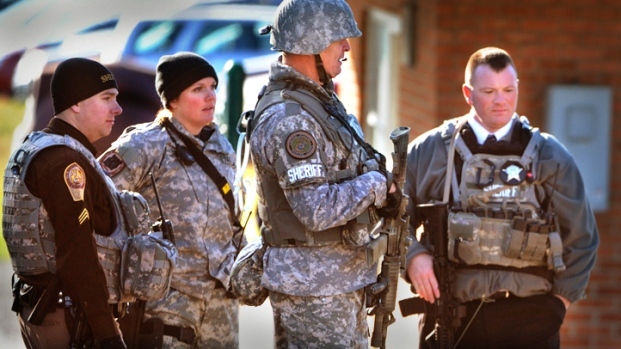 Heavily armed officers on foot, K-9 units, SWAT vehicles and other police vehicles patrolled the campus. All building on campus were searched and cleared. 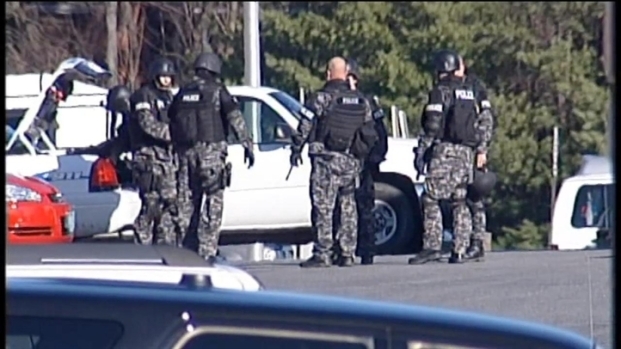 Raw video of the scene at Virginia Tech courtesy of WSLS. The investigation was expanded to include a rest area on northbound Interstate 81 near Radford after a report of suspicious activity there. 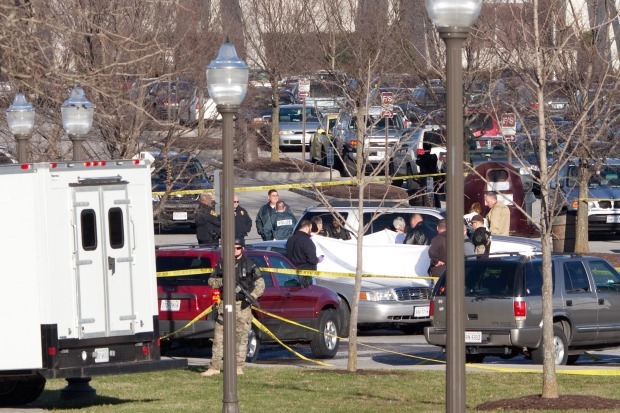 Investigators do not know whether that scene is related to the shooting at Virginia Tech. The gunman's description matched that of a man sought in a robbery Wednesday night in Radford. Police are investigating whether the incidents are related. Virginia State Police took the lead in the investigation. Anyone with information about the incident should call campus police at 540-231-6411. Crouse, 39, was an Army veteran and father of five. He previously worked at a jail and a sheriff's department. 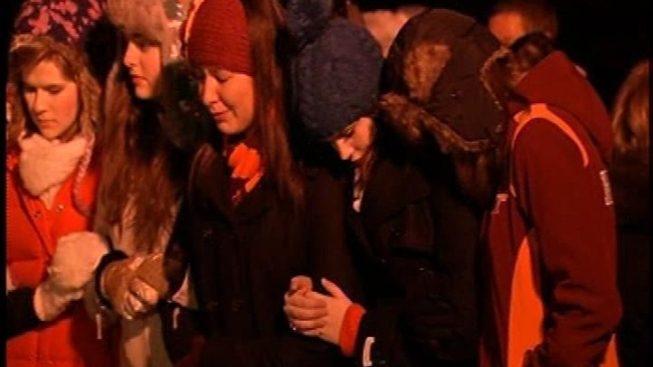 A vigil will be held on campus Friday at 6:30 p.m.
At 2:20 p.m. the school posted on its website that several reports of shots heard and suspicious activity were investigated and are unfounded. “There were no further founded sightings or concerns reported to Virginia Tech police,” Deisinger said. The school told the campus community to shelter in place during the investigation and asked visitors to stay away from campus. Alerts were sent every 30 minutes regardless of new information. Blacksburg Transit bus service also was suspended during the alert. "I am deeply saddened by today's news of another tragedy affecting the Virginia Tech community," Gov. Bob McDonnell said in a statement released Thursday evening. "Our thoughts and prayers are with the families of those impacted by these shootings." There is an active campus alert in Blacksburg. Everyone should seek shelter or stay where you are. Blacksburg Transit service is suspended until the alert is lifted. Suspect described as white male, gray sweat pants, gray hat w/neon brim, maroon hoodie and backpack. On foot towards McComas. Call 911." " A police officer has been shot. A potential second victim is reported at the Cage lot. Stay indoors. Secure in place." Derek O'Dell, a third-year veterinary student at Virginia Tech who was wounded in the 2007 shootings that killed 33 people, was shaken. O'Dell monitored the situation from his home a couple of miles from campus. Student Kathleen O'Dwyer, of McLean, said she had difficulties making calls with her cell phone from her off-campus apartment. She said it's similar to cell phone problems that occur during football games at Virginia Tech. A couple of hundred people were locked down at Squires Student Center, where they were assembled on the second floor, student Elizabeth Sullivan said. After SWAT teams patted them down and checked their bags, they were moved to the ballroom. “It's crazy that someone would go and do something like that with all the stuff that happened in 2007,” said Corey Smith, a 19-year-old sophomore from Mechanicsville, Va., who was headed to a dining hall near the site of one of the shootings. He told The Associated Press that he stayed inside after seeing the alerts from the school. “It's just weird to think about why someone would do something like this when the school's had so many problems,” he said. White said he didn't panic, thinking instead about a false alarm about a possible gunman that locked down the campus Aug. 4. White used an indoor walkway to go to a computer lab in an adjacent building, where he checked news reports. “I decided to just check to see how serious it was. I saw it's actually someone shooting someone, not something false, something that looks like a gun,” White said. Campus was quieter than usual because classes ended Wednesday and students were preparing for exams, which were scheduled to begin Friday. All exams scheduled for Friday will be taken at the same time and location on Saturday. Virginita Tech Police Chief Wendell Flinchum was in D.C. Thursday for a hearing at the U.S. Department of Education to appeal a $55,000 fine levied on the school after the fatal April 16, 2007, campus shootings. Thirty-three died in that massacre, including gunman Seung-Hui Cho. It was the deadliest mass shooting in modern U.S. history. The Education Department said the school violated the law by waiting more than two hours after two students were shot and killed in a dorm before sending an email warning to the campus community. By that time, Cho was chaining the doors to a classroom building where he killed 30 more people and himself. The department also said the email was too vague because it mentioned only a “shooting incident” but did not say anyone had died. The school's alert system was tested several times before. In August, no gunman was found after an alert, and the all-clear was given after about five hours. In 2008, one dorm was locked down for two hours when an exploding nail gun cartridge was mistaken for gunfire.